I recently found myself in need of a portable install of the Jupyter notebook which made use of a portable install of R as the compute kernel. When you work in institutions that have locked-down managed Windows desktops, such portable installs can be a life-saver! This is particularly true when you are working with rapidly developing projects such as Jupyter and IRKernel. It’s not perfect but it works for the fairly modest requirements I had for it. Here are the steps I took to get it working. This version of Portable Python comes with a portable IPython instance but it is too old to support alternative kernels. As such, we need to install a newer version. Open a cmd.exe command prompt and navigate to Portable Python 2.7.6.1\App\Scripts. If you try to launch the notebook, however, you’ll get error messages. This is because we haven’t taken care of all the dependencies. Let’s do that now. Ensuring you are still in the Portable Python 2.7.6.1\App\Scripts folder, execute the following commands. The version of Portable R I used didn’t include various necessary packages. Here’s how I fixed that. This file needs to go in the R_kernel directory created earlier. Note that the kernel location specified in kernel.json uses Linux style forward slashes in the path rather than the backslashes that Windows users are used to. I found that this was necessary for the kernel to work –it was ignored by the notebook otherwise. 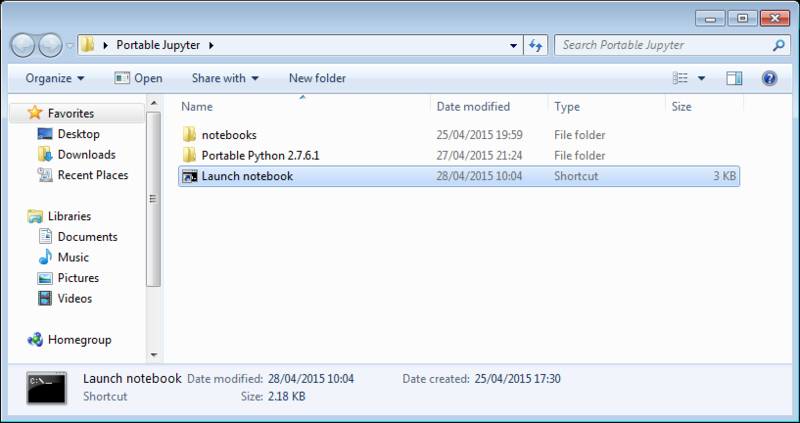 I created a folder called PortableJupyter and put the Portable Python 2.7.6 folder inside it. 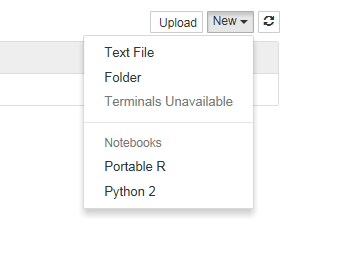 I also created the folder PortableJupyter\notebooks to allow me to carry my notebooks around with the software that runs them. %windir%\system32\cmd.exe /c "cd notebooks && "%CD%/Portable Python 2.7.6.1/App\python.exe" "%CD%/Portable Python 2.7.6.1\App\Scripts\ipython-script.py" notebook"
This starts the notebook using the default web browser and puts you in the notebooks directory. I can choose the Portable R kernel and start using R in the notebook! Back in December 2014, I learned that I’d be moving from The University of Manchester to The University of Sheffield to do the type of thing I’ve always done which is a combination of research software engineering and research software support. I’ve been in Sheffield for two months now and am having a blast! There’s so much cool stuff going on here that it makes my head spin a little and the community at Sheffield have welcomed me with open arms. It truly is a wonderful place in which to work. One of the departments I’ve started working with is The Sheffield Institute for Translation Neuroscience (SITraN). 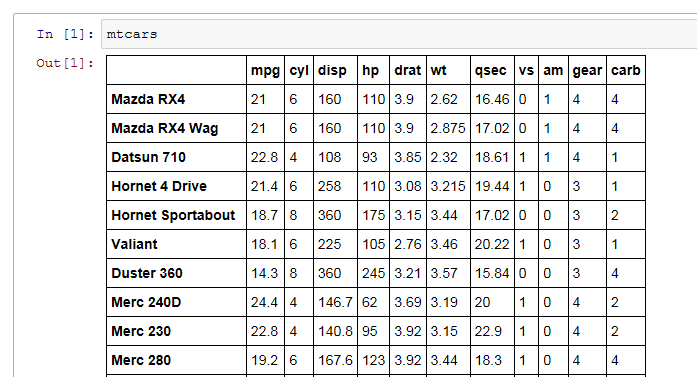 My contributions have been relatively minor so far – A bit of Python coding for a machine learning project called GPy and some code speed-up work in R for Winston Hide and his collaborators. When I hang out in SITraN, I usually sit with the machine learning people and listen in on their conversions about Python, MATLAB, GPUs, C++ and R — it’s essentially Nerdvana for someone like me. On to the point of this blog post. SITraN now have their own blog called SITraNsmissions where they’ll be discussing various aspects of their work and how it applies the principles of neuroscience to help treat diseases such as Motor Neurone Disease (MND). In the video below, taken from SITraNsmissions first blog post, Professor Pamela Shaw gives an overview of the work that SITraN does. I recently got a 15 inch Retina Macbook Pro which contains an NVIDIA GT 750M GPU. It’s been a while since I last got a laptop with a decent GPU in it so I wondered how it would perform in MATLAB using the Parallel Computing Toolbox. Of course I didn’t read any documentation; I simply fired up MATLAB 2015a and issued the gpuDevice command. that you have a supported GPU and that the latest driver is installed. This is because I didn’t install a load of CUDA-related stuff! Following these instructions did the trick! I headed over to the MATLAB File Exchange to get the GPU Bench App for MATLAB and fired it up. The summary of the results is below. Click on the image to see the detailed results. The double precision performance of this GPU card is very poor – MUCH slower than the CPU on the Macbook Pro. Looking on the bright side, the numbers for the CPU are pretty good for a laptop!